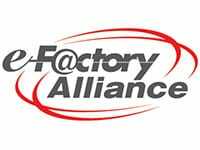 Vision Camera for Robotics - Allied Automation, Inc.
Mitsubishi Electric and e-F@ctory Partner Datalogic have developed a solution to integrate vision with automation controllers on the shop floor to improve productivity. The Datalogic machine vision product line up encompasses a wide range of inspection equipment, from vision sensors to high end vision processors to improve production. Linked to Mitsubishi Electric’s renowned robot controller, the two represent the perfect combination for high precision robot control in small to high end vision systems. Datalogic’s complete family of high performance smart cameras and embedded machine vision systems utilize the same software across all products. The hardware consists of vision sensors, smart cameras, and vision processors. These products are specifically designed and developed to meet all your manufacturing inspection requirements and to get your application up and running faster. This is a common medium resolution setup of the P10 Vision System that we use with the robots.